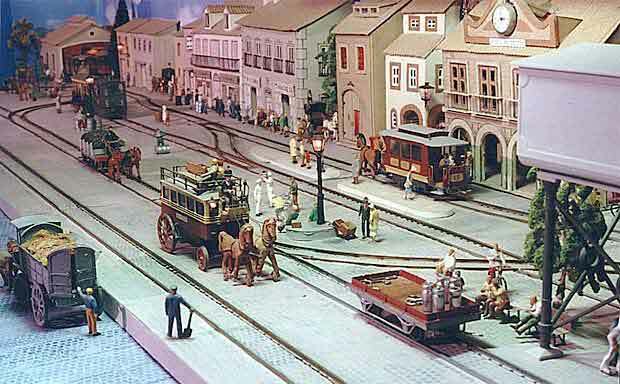 Rafael A. Gil Fornés, who lives in Buenos Aires, Argentina, has created a unique and exciting “living museum” of urban transportation in the 1890s. 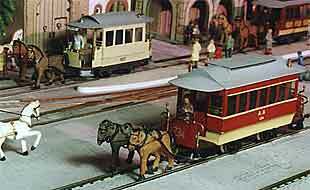 Featuring working horse cars and steam tram locomotives in OO scale (1:76), Rafael’s small layout recreates the atmosphere of Old Madrid but includes models from many cities of the world. Jeff Hartmann, from Long Beach, California, sent along this photo of his mockup of a version of Box Street Yard that is even smaller than the original! Jeff laid out the HO trackage on a table to make sure everything would fit in 36″x9″. 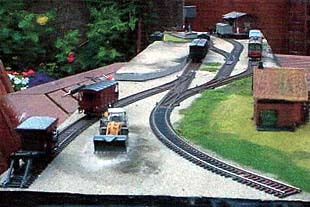 Notice that he has flipped the layout plan 180 degrees to better suit the trackage he has available. The sector plate will be at the left, behind the partial backscene. 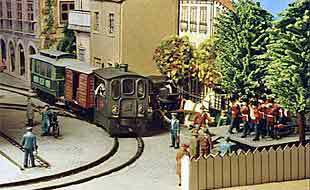 Quite a number of Box Street Yard variations are now under constrction in various parts of the world. This layout design by Jack Trollope is well on its way to becoming a new classic! 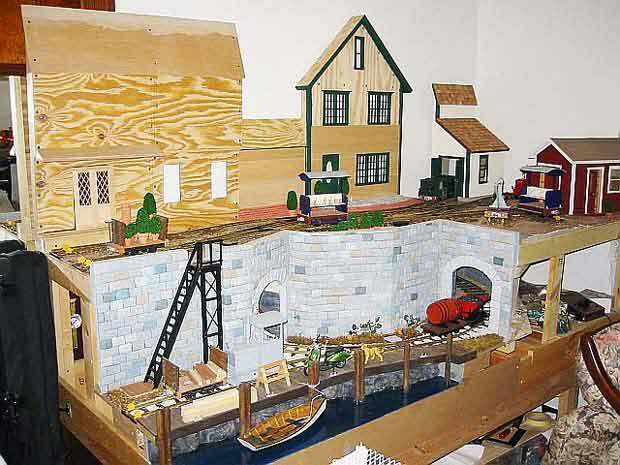 Bill Cooke checks in with an impressive progress report on his Hedgehog Hill Estate Railway, which carries New York state wine from the winery (top level) to the shipping wharf (lower level). These models are extremely large — they’re built in 7/8n2 scale, using G-gauge trackage to represent two-foot gauge prototypes! Bill’s layout in this giant scale measures 84″x36″ — but it really is a small layot when you consider that the same display built in On2 scale would measure just 25″x10″! To the best of my knowledge, the HHER is one of only a few indoor 7/8n2 railways in existence. The lower-level wharf area is virtually complete and detailing is well along. The upper-level winery is starting to take shape, with the low-relief buildings under construction. Stay tuned…perhaps Bill will share more photos with us as this unusual layout continues to progress. 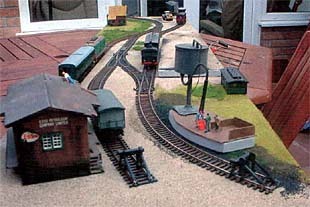 Mervyn Trigg, who lives in Wales, has concocted a very nice small switching layout in HO/OO scale. His comments: “As you can see the layout is in ‘foreign mode’ at the moment, but tonight I have got out my S1 and a couple of boxcars and have spent a couple of hours merrily switching. The building with the yellow roof is an old watermill, and I have just finished chiselling out a pond to fit it. All the stuff on the layout is from my junk box hence the name, Economee.” Please keep us posted on your progress, Mervyn! Martin Stierlan, who lives in Korntal, Germany, has converted a defunct former layout into a new, small layout for exhibition showing — he calls it the Arizona Central RR. 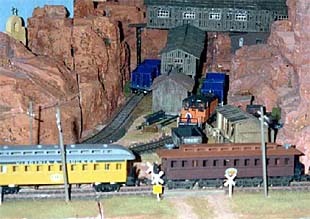 The goal was to make use of some excellent Western U.S. scenery he had previously built, add in some of the equipment and buildings that he had accumulated over the years, and produce a small layout that could travel to exhibitions in his car. The pictures show the results. Martin has squeezed in a smelter and added an elevated branch to a mine to embellish the basic 18″ radius loop of track. 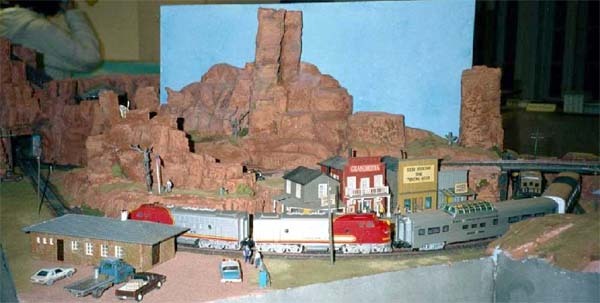 He had fun combining old-time and modern buildings, and runs a wide variety of locos and cars from his HO collection. Everything seems to work together and run just fine. 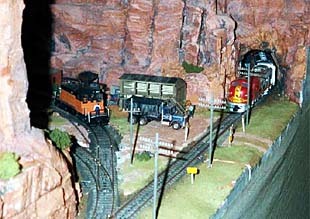 Sounds like a good way to have fun with model railroading!